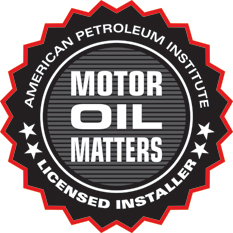 When choosing oil for your vehicle, you should always look or ask for API-licensed oil. API has made it easy to find these oils: licensed oils display one or both of the API motor oil quality marks—the API Service Symbol “Donut” and the Certification Mark “Starburst.” These marks are part of API’s Engine Oil Licensing and Certification System (EOLCS), a voluntary licensing and certification program that authorizes engine oil marketers meeting API requirements to display the API quality marks. The API “Donut” identifies oils that meet current API engine oil standards. It includes the SAE viscosity grade of the oil, API standards met by the oil, and other important performance parameters. The top of the “Donut” displays the motor oil’s API performance standard. The letter “S” followed by another letter (API SN) refers to oil suitable for gasoline engines, and the letter “C” followed by another letter and number (API CJ-4) refers to oil suitable for diesel engines. The center of the “Donut” shows the motor oil’s SAE viscosity grade. Viscosity is the measure of an oil’s ability to flow at certain temperatures. The bottom of the “Donut” tells whether the motor oil has resource-conserving properties when compared with a reference oil in an engine test. Motor oils labeled as “Resource Conserving” have passed this test. The API “Starburst” signifies oils which meet the latest International Lubricant Specification Advisory Committee (ILSAC) standard. The ILSAC standards are developed by vehicle and engine manufacturers, oil and additive companies and industry trade associations such as API, ACC, ASTM and SAE. These oils provide engine protection while also delivering improved fuel economy and emission system protection. According to National Oil and Lube News the results of vehicle inspections held at community car care events across the country during Car Care Months in April and October 2012 revealed that 77% of vehicles need service or parts. An annual analysis of vehicle inspections forms found the top three problem areas posting the highest failure rates to be engine oil (22%), engine cooling systems (20%), and brake service (18%). 8% of vehicles had the check engine light on, and new air filters were needed in 19% of the vehicles. At least one belt was reported as unsatisfactory in 14% of the vehicles inspected, and 10% required at least one new hose. Battery cables, clamps and terminals needed maintenance in 11% of the vehicles inspected, while 19% of the batteries were not properly held down. When checking lubricants and fluids, the top 3 failure rates were: low or dirty motor oil at 22%; low, leaky, or dirty coolant at 20%; inadequate brake fluid levels at 18%. Power steering, coolant and transmission fluids were also checked and had failure rates of 14% or below. Approximately 14% of vehicles had front windshield wiper failures, and 1% needed service to rear wipers. At least 13% of vehicles needed lights replaces, including headlights, brake lights, and license plate lights. Improperly inflated tires were found on 9% of the cars, and 10% had worn tread and were in need of replacement. The tire pressure failure rate has steadily declined after recording the highest rate of 54% in 2003.